There’s not much that beats ice cream to a child. However, I can think of one thing that always beats ice cream in a challenge with my children. No it’s not candy, Disney. Anything Disney related our family is all over. like and put it on their wall. Boy was I wrong from the start. Let me explain. First, it took me forever to choose my sticker. Wall 2 Wall Sticker has an awesome selection of stickers, there was something for all of my children. My children range from two all the way to 14. It was very hard to decide who would get the sticker, lucky everyone did something to get into trouble, but my toddler. Yes, I know I think the moon was full. Normally she’s the one that’s causing the problems. Once I ran into Angus, I knew that was the sticker. My daughter loves animals and what’s cooler than a huge horse from one of her favorite Disney movies. Angus is a removable wall sticker, as well as GIANT! If you’ve seen Brave, you already know he’s Merida’s loyal steed. Angus comes in two sheets of 27″ x 40″, when assembled he is 52.25″ X 50“. Angus comes in several different pieces, to put him together simply apply each piece in order, then add the additional accents as you please. Not to worry if you need to move Angus a little, the decals can be removed and re-positioned without damaging the wall or leaving that nasty residue behind. Second, choosing where to place the wall sticker was difficult. When I like something I want it to be perfect. Since mom is lucky and still has control of where things go in Mattie’s room, I had to find just the right spot. I love the sticker, I want to be able to see it, and I want my daughter to enjoy it just the same. Third, getting my husband to help me after work. We had recently painted her room, my husband was working late, by the time he was home Mattie was heading to bed. Finally last weekend, he was off, I was off, time to put up the sticker. I mentioned how much I loved the wall sticker, want to know why? It’s huge, it’s awesome, it’s Disney, and it’s Angus from Brave. Two of my favorite things, Disney and Angus from Brave. Adding huge and awesome, was the icing on the cake. Angus was sent to use in a thick cardboard tube, to keep it from getting hurt during shipping. Let’s face it, when mailing something one MUST watch out for their products. I would have been rather sad if Angus would have arrived crinkled, torn, or hurt in any way. I give Wall 2 Stickers TWO THUMBS UP on shipping. I received Angus in no time, he is awesome, and arrived without a scratch on him. Thanks Wall 2 Sticker. I waited for my husband to help me apply the sticker, like I said when I really like something I want perfection. I know my husband is patient and does well with anything like this. I was actually surprises how easy it was to apply the sticker. Angus came to use in several different pieces, but placing them on the wall was a breeze. It took us about 20 minutes from start to finish, and that was with us laughing at my toddler. 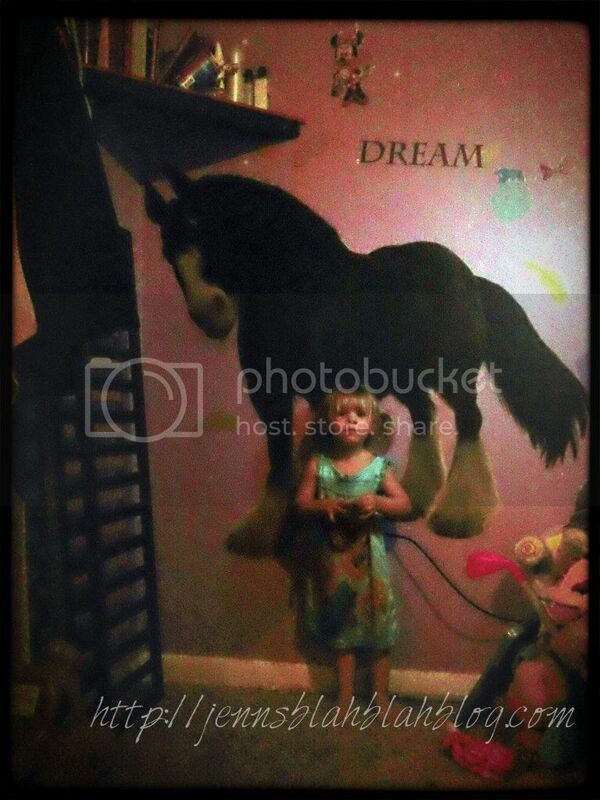 She was so excited to share a room with Angus, she dug out all her ponies so he would have friends. What can I say the girl knows what’s awesome, just like her mommy! The sticker has only been up a week, but still looks amazing. I have bought plenty of stickers for all my children in the past. If you have bout them, you probably know that peeling during the first week happens often. I sure am glad Angus is okay, I think my daughter and I would be rather upset to see him peeling off the wall. I don’t think Angus will peel off the wall unless someone starts messing with him. He seems to stick much better than most of the other wall stickers I have used in the past. Needless to say I love Angus, he looks great, and is made with quality in mind. Now the real person that matter in this review is my toddler, Mattie. So what does she think about having a huge Angus in her room. She loves him. Every night before bed she goes and gives him a hug and a kiss, tells him she will see him in the morning and to dream about apples and cupcakes. APPLES AND CUPCAKES, UMMMMMM maybe houses on walls dream of apples and cupcakes. What do you think apples and cupcakes, or a way to get unstuck, lol. Oh, well whatever Angus dreams about is fine as long as he makes my daughter’s room more present. About two weeks ago, my older daughters decided to start talking about ghost. Needless to say Mattie’s been in our bed, until we put Angus up. Now Angus watches out for her, and if those bad ghosts come around Angus will kick them, and step on them with his big feet. It was super cute, she tells me, “Mom Angus saved my life last night. There was this ghost going to get me, and Angus just kicked him. No more ghosts.” WOW, this whole time it’s just that easy, she needed someone to watch out for her while she sleeps. Thanks Angus, for making my toddler feel safe. I have to admit, I would feel pretty save with a horse on my wall bigger than I was. If you’re looking to spice up your children’s room, or any room in your house for that matter be sure to swing by and visit Wall 2 Stickers. They have a variety of stickers. seriously something for just about everyone, at a reasonable price. I love Wall 2 Stickers, they have an amazing selection, quality products, and have been wonderful to work with. We give Angus TWO THUMBS UP, from start to finish. Everything was just as it should, thanks Wall 2 Sticker for allowing my daughter to have a huge Angus in her room. Now, to buy the rest of the Brave collection. Is Angus worth $50.99? I would definitely spend the money on this sticker. I plan on purchasing more of the Brave Collection for my daughter for Christmas. She loved the stickers, they are quality, and there’s a huge selection to choose from. Take a few minutes and visit Wall2Sticker.com. What do you think? Was Angus a great choice, or would you have picked something different? Those are really cool stickers. I wish we could use them in my daughters room. Maybe someday soon. These seem like they would be tricky to put up being so big - good to know it wasn't that bad. Good way to change wall stickers with the years since kids tastes change as they get older.BTW - the link in the Rafflecopter doesn't go through (the arrow to go to your review from the blog post itself works). Angus looks lovely :) their products look great. And they do have something for everybody! I've been looking at the dry erase decals, I have a board on my fridge now but it seems to eat the whole fridge; and I can't put any of my son's awesome school work on there to show off :). So I'm wanting to change that soon. Great review also. Great review! Super informative, and most importantly: honest. It was refreshing to read such a well-written review. Any question that I could have possibly asked was answered, and it was interesting and kept my interest. Very nice to read about real people using products. Your daughter is adorable, and sounds very sweet: she certainly deserves such awesome surprises. You're a great mom! I love how they wont mess up the wall, and how real-like the horse looks! To cute and it is so big! That looks like the perfect sticker for a great girl room. I would love that in my daughter's room. The horse was a great choice - all kids love horses. I would have picked Strawberry Shortcake - just because I love her and they didn't have Raggedy Ann. I checked out the site and you are right - what a wonderful selection they have. I love the large wall stickers. Also I must have the peel and stick mirrors - they are awesome. That is huge. I like that it can be moved without damaging walls. Aww, it looks great! I like to hear that it was easy to put up. I love how big the sticker is and that you can relocate it if you put it up wrong. Ive never seen Brave, so wouldn'e have choose that sticker. But I must say, your daughter has a great imagination, my Grandson is the same way. Im glad you encourage her. Oh and BTW, she's a cutie. thanks lisa, so glad you like it... heck ya Angus rocks my daughter now loves to sleep in her room. These stickers are a great idea for kids' rooms--you can change and remove them as age and tastes change. Very simple decorations! 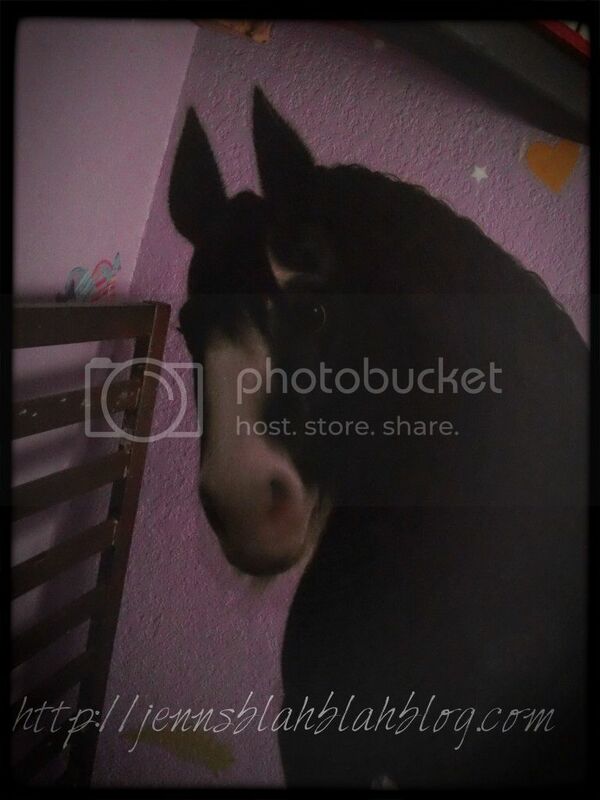 Angus looks really cute in your daughters room. I know she must love it. Your little girl is so cute. Your review is great and the wall sticker looks good. Im glad your daughter gets so much enjoyment from it. There are so many Wall Stickers that I love! Today's wall stickers that I liked are the 3D Butterflies! There are so many wall2stickers that I like! There are designs for a child's room, the living room, and kitchen and bath! I think that they are all reasonably priced. I would consider buying some of these wall stickers! Awesome, I love that you can make the room look personal. I like the giveaway that you are having for these different wall stickers! There are so many really awesome stickers to choose from. I could get lost trying to decide what I want! I really like so many and they really brighten up a room and make it look unique! The wall sticker looks awesome! ...but I rather liked the story about Mattie and Angus ...hehe! I am happy for you that your daughter is sleeping in her own room again. Who would have thought that Angus would help out so much. I liket he fact that it is so big. and that it is durable, seems like it will last forever or at least a long time. I looked through all the stickers and that are awesome. I am definitely going to get some for my walls. Thank you for your review. they do have some great prices and awesome choices. Angus is pretty cool and big. OMG now that's a sticker!! I really enjoyed reading about who got the sticker lol She looks so tiny standing next to Angus. I haven't gotten to see the movie yet. I love Disney. That's huge. I'll bet your daughter loves it! Was wondering about the multi-part bit or one really big sticker. Glad to hear in pieces. i have to agree there are TONS of stickers to choose from. you click on 1 group and it gives you another group to choose from and from there, there are pages full of stickers!! oh my your little girl is absolutely adorable! And I do agree, they have an awesome selection! The horse sticker looks fantastic. Any little girl would just love these!